Got there in the end. Instead of making a fully home-made tart I went to buy an uncooked pastry at the local supermarket, for this recipe to appeal to busy households. Quince glazing optional, can be replaced with something else. End result (click to enlarge). Usually I make round tarts with shortcrust pastry. I only had the option to buy puff pastry, in this small supermarket opened early Sunday morning, four hundred meters away from our home. And when I got back I realised that yes it was ready-rolled, but it was of a rectangular shape. Maybe “sheet” in “Puff Sheet” means that it is rectangular indeed, but I didn’t catch that. In France the standard ready-rolled pastry is round. Whatever, I would have bought it anyway, I was ready to change my cooking habits all the way. So I had to find a rectangular dish. I went for what we use for cooking poultry and small potato or courgette “gratins”. It was the right size. 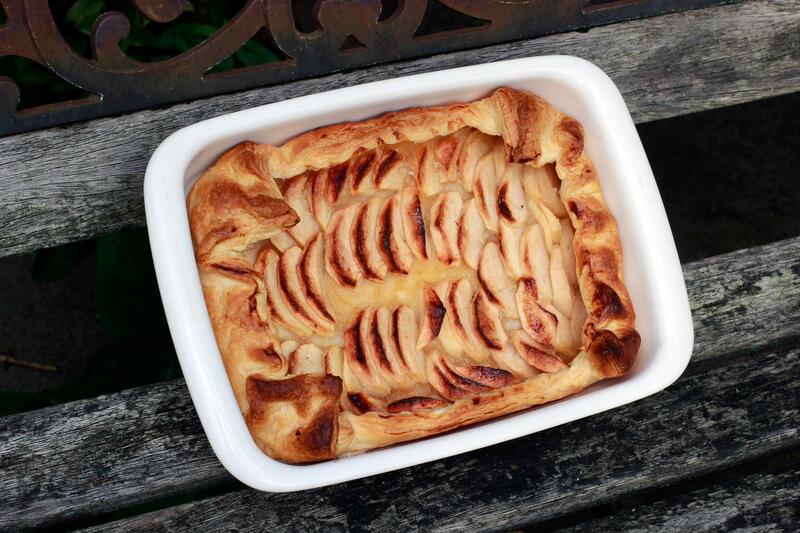 Then it was puff pastry, and I usually use shortcrust or “pâte brisée” to make apple tarts. I thought about it and felt it would be a good idea to add a bit of melted butter and sugar to the apples to get something slightly crusty and possibly caramelised going well with puff pastry. It was not necessary, but I felt it would make the right dessert for my friends tonight. 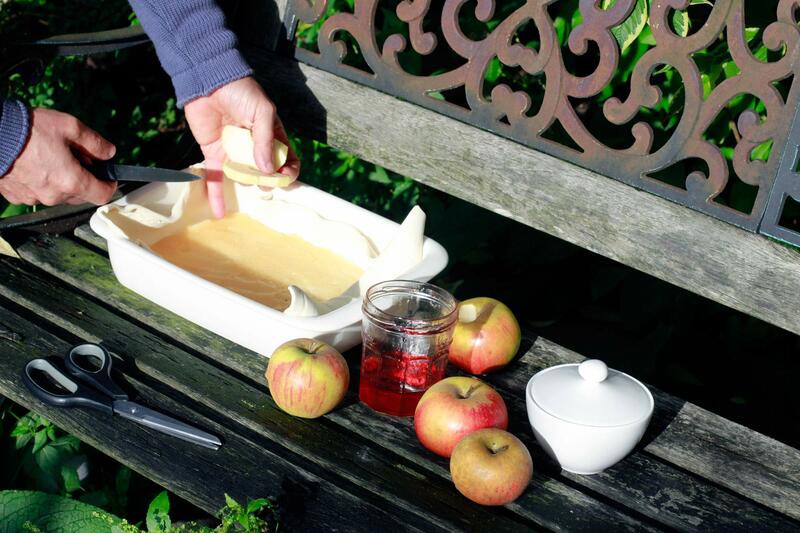 Quince jelly or glazing has a nice colour and will bring additional taste and sweetness to the tart. – Chilled uncooked puff pastry sheet. 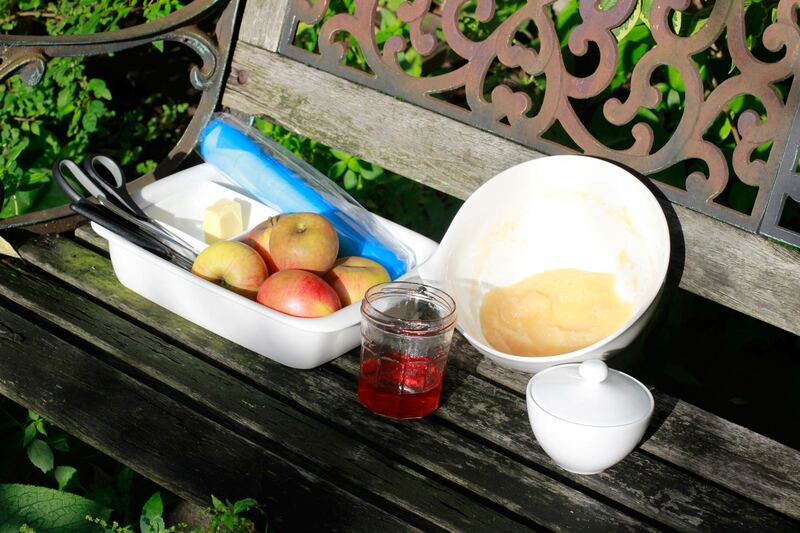 – The rest of the compote I made on 22 Oct. (see ‘Save the apples!’). I would have liked to have a bit more, to make a good minimum 2mm layer below the apples, but it would be OK to just use what I had left. – I didn’t know how many apples I would actually need, so I took a few from my stock of various varieties picked in Wimbledon. In the end I used a bit more than the three largest apples on the picture above… and ate the rest of the fourth. – 25g butter (some would put more, some wouldn’t put any at all). – A table spoon of sugar. – I could have added a hint of vanilla even if there was already some in the compote. 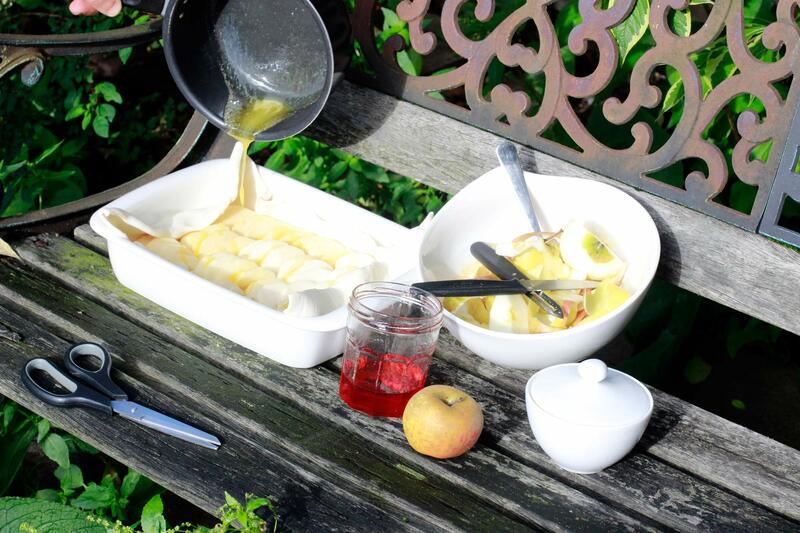 – Quince jelly or glazing (I will say how I made it in an other blog post). It takes 10 to 15 minutes to prepare the tart with the ready-rolled pastry, including washing the dishes, and 20 to 30 minutes to cook it. Preheat the oven to 200°C (gas mark 6). After putting the pastry in the dish and spreading the compote on top of it, I peeled, cored and cut the apples in 3 to 4 mm slices. 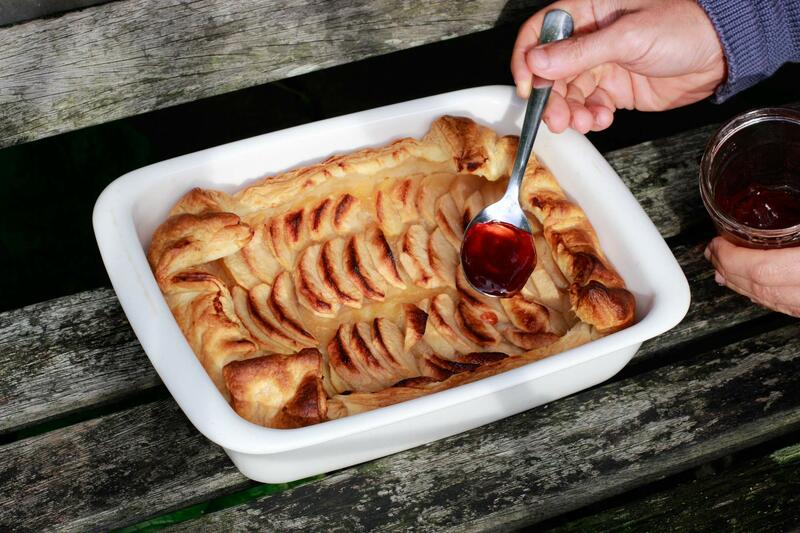 Avoid thicker slices: depending on the variety of apples, the pastry may burn before the apples are tender. Here you can see how much can be covered with one large apple. Click to enlarge and see how the slices are placed one on each other. Actually I should have made sure that the slices covered each other more, as they shrink during the cooking. Added the 25g of melted butter and the levelled table spoon of granulated sugar, just personal taste. After 25 minutes in the oven. As you can see I could have put more apples. 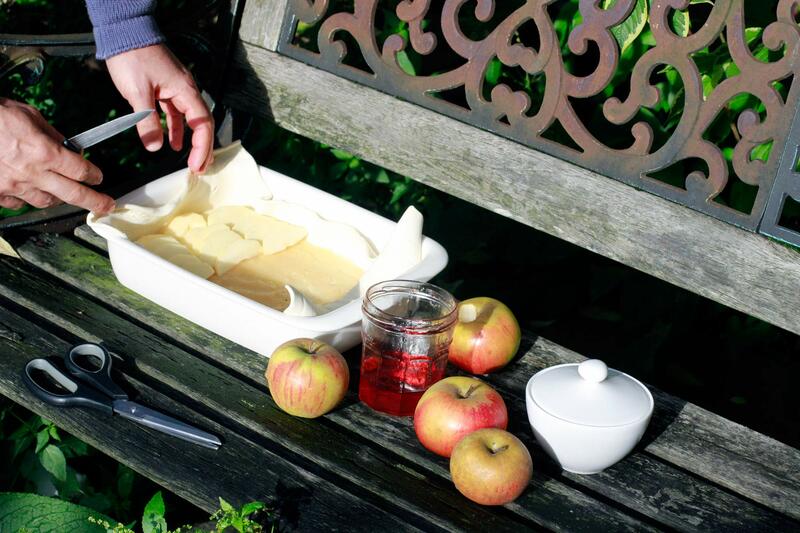 Added the finishing touch: three spoons of quince glazing, the taste of which goes very well with the apple tart. 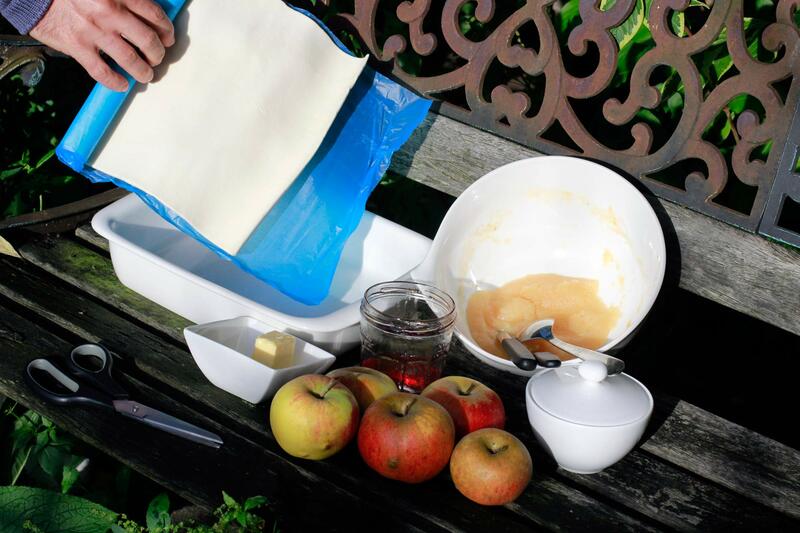 Quince glazing, made of course with fruit from South West London gardens: see one of my next blog posts. In the meantime I hope we will like the tart tonight. Honestly, I have little doubt! 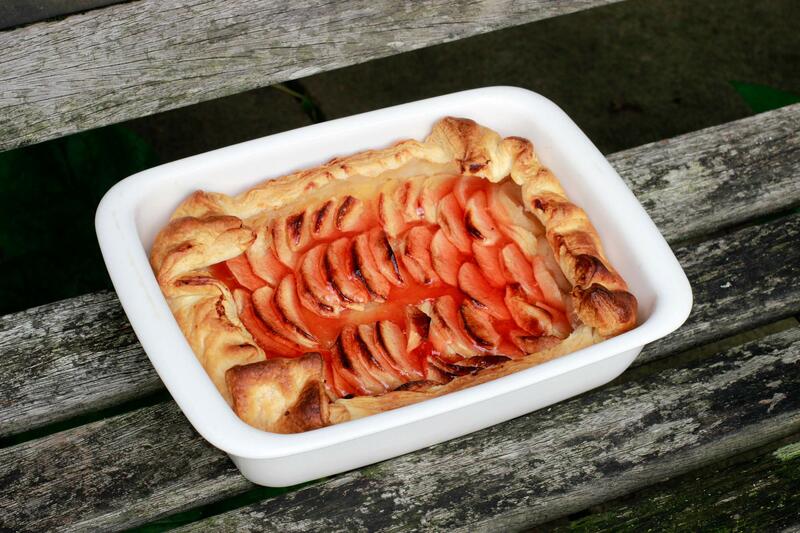 This entry was posted in Eat and tagged Apples, Quinces, UK, Wimbledon by Les Jardins d'ici. Bookmark the permalink.